This is my sixth morning of yoga and I’m thinking am I nuts to get up even earlier than way before dawn to do this?? Sure that meditation-y feeling is nice and it really is quite amazing to think that the body can hit such poses when one is fighting off dreamland but please, I need several more hours in the day just to do this sort of stuff because I actually do *not* think that sleep is overrated! So I start thinking of it this way. Did I really need to watch two episodes of Battlestar Gallactica (Season 1 of the reboot from the SF channel-really good) when I came home from work yesterday? Yes, I acknowledge that I didn’t exactly “watch” per se, but made dinner for my family, removed all the ornaments from the Christmas Tree, took down the lights and packed everything. So that’s “fair,” right? So why do I feel “bad” about it? Why do I insert the “but,” the — but I could have been doing yoga, shadow boxing, lifting weights, reading, paying bills, doing laundry. Oy! Balance! What’s a person to do? As with a lot of people I know there is way too much going on from day to day: a full day’s work, the business side of one’s domestic life, family time — not to mention attempting to keep oneself in some sort of physical “shape,” plus whatever other stuff is out there for one’s own personal growth. Say taking classes, writing, gym time, running/walking/hiking/biking, doing pottery, painting, reading … and so on. It all brings me to the notion that many of us live in a sort of permanent sixth day. We wake-up much too early, go about creating the world, get to bed much too late and rather than taking a day of rest, get up for yet another day of creating the world. 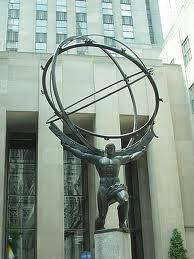 It brings to mind that we are all like Atlas. We are over-scheduled, over-stressed and over-worked — not in and of itself a “bad” thing so much as the fact that we are all so tired and need a space to slow it down; the chance to say, the seventh day is not a bad idea after all. And no it doesn’t mean that one has to get “religion” and go running off to a house of worship, rather, it’s a way to acknowledge that when one is working hard, very hard for that matter, it is A-OKAY to be a slug for a day. 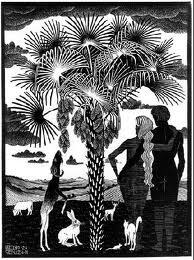 Further, how one structures that seventh day is really, ultimately up to oneself. For religious Jews, the seventh day is a weekly holiday. One eats a huge meal with family, sings, dances, prays, and then sits around till the end of the sabbath period. I’m oversimplifying, but the kernel of the idea is that we all owe ourselves some rest, if nothing else than to be restored enough to fight the next battle with our wits about us. Oy, indeed. You made me realize how tired I am. At least you multitask and get stuff done. I just think about it.